In addition to the 12 ballplayers profiled in our last post, 20 other ballplayers came to bat for the Durham Bulls in 2012. Players are listed in order of number of games played. The “slash line” is Batting Average/On-Base Percentage/Slugging. An asterisk after a player’s name indicates he bats left-handed, a # sign indicates he is a switch hitter. 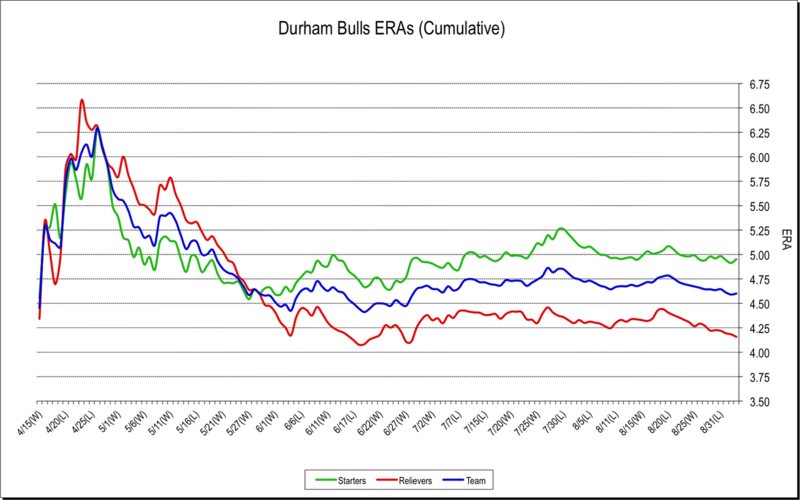 Basic 2012 Bulls stats are here and here. Will Rhymes* (29) played in 46 games (194 times at the plate) in his two stretches with the Bulls. He was mostly at second base. Decent, but not particularly helpful hitting numbers, .256/.326/.361 with 21 RBI, an OK wOBA of .320 and a slightly negative wRAA of -0.9. Rhymes was an infielder-in-waiting all year for the Rays as they moved folks on and off the disabled list. Mostly Rhymes stayed with the Rays. However, the Rays dumped him off the 40-man at the end of the Bulls season, when the Rays designated him for assignment. I was mildly surprised to see him pass through waivers. Will the Rays want Rhymes back next year? A larger question might be, does Rhymes want to come back? Hard to tell. 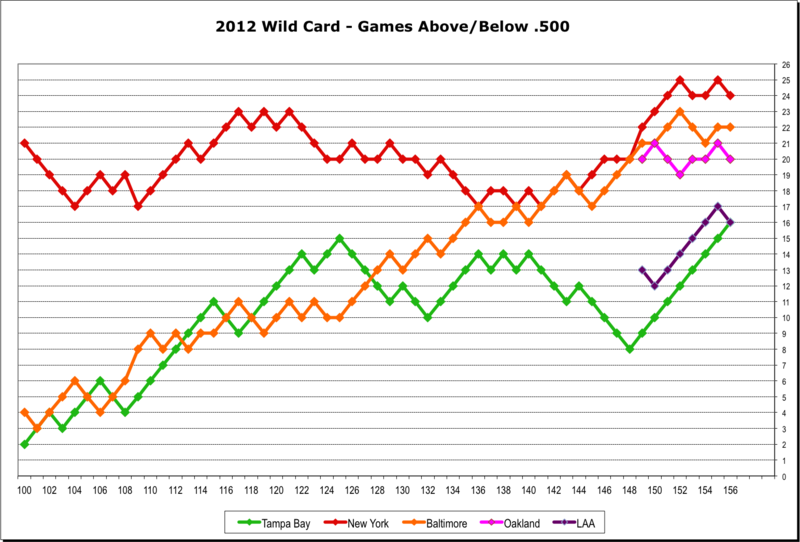 My guess is that everything will depend on how the Rays are looking at their future infield. Juan Miranda* (29) started the season with the Bulls, then was moved on in early June. He was in 44 games (176 PA) primarily at first base. Miranda is one of the poster children for the Rays not treating the Bulls right this year. Signed at the last minute, he stuck with Rays through spring training then was assigned to the Bulls. He went 0-5 with three strikeouts on opening day back in April. He stayed until June when he was released to make room for Brandon Allen (see below). His numbers: .187/.307/.273 with only 8 RBI. His wOBA was .279 and his wRAA was -6.3. Nevin Ashley (27) was one of the Bulls I was looking forward to watching this year. But he broke his hand in April and didn’t make it back until late July. He got into 35 games with 130 plate appearances. We are getting into small sample size issues here, take everything hereafter with a grain of salt. Decent numbers. Slash line: .245/.357/.455 with 13 RBI. His wOBA was a decent .363 and his wRAA was 3.8. 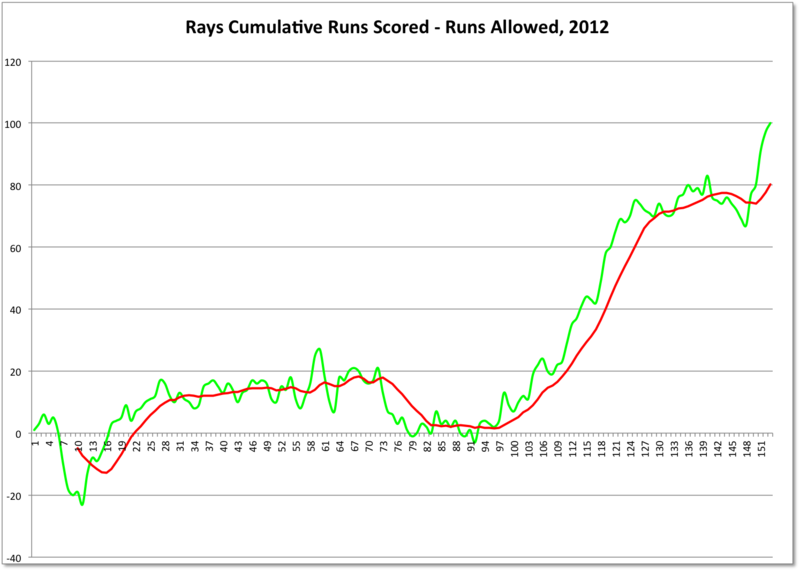 If anyone didn’t think that catching was a tough job, they should look at what happened to the Rays this year. At least Mr. Ashley got back into a lineup. Robinson Chirinos spent the entire year on the DL. Kyle Hudson* (25) was traded to the Phillies system for Rich Thompson. He started the season with the Bulls and played in 31 games (133 PA). 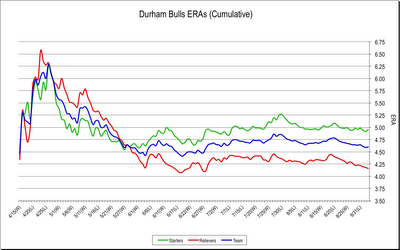 As a Bull he had some decent numbers, .291/.378/.318, wOBA .327, wRAA 0.2. However, the rest of the year got pretty ugly for him as an Iron Pig with a wOBA of 281 and wRAA of -11.5. Brandon Allen* (26) was the last of the collection of late signers that showed up in Durham (following Feliciano, Salazar, Mangini, and Miranda). He played in 29 games (129 plate appearances) after being sent down by the Rays. His numbers are OK. Again, please note we are venturing well into small sample size territory here. His .263/.295/.451, 14 RBI, wOBA of .327, and wRAA of .2 reflect end of tenure improvement, because his start wasn’t very good. Allen was off to play in Japan in late July. Brandon Guyer (26) is a terrific young ballplayer who started the season with the Bulls (22 games), got called up, messed up his shoulder, and was on the disabled list for the rest of the year. Maybe in 2013. Brooks Conrad (32) was a mid-season hire by the Rays who finished the season with the Bulls (25 games. He was very helpful at the end. Not likely to be back. Hideki Matsui* (38) was one of the odder moments in Bulls history. He was signed by the Rays and sent to the Bulls to get in condition. He played in 13 games and apparently helped the Bulls out quite a bit on the financial side. Otherwise, his numbers were pitiful, .170/.231/.444. For a while it was fun having him around. But also a little sad. Evan Longoria, Jeff Keppinger, Sam Fuld, Jose Lobaton, Desmond Jennings, Luke Scott, and Matt Joyce all had rehab assignments. Other than having the opportunity to see the big leaguers on the field, an unfortunate reality of minor league baseball is that these fellows aren’t much help to the team. As a group they played in 31 games, had 125 plate appearances, and only managed 8 hits (.198) with a grand total of 8 RBI, half of those on Luke Scott’s two home runs. Catcher Craig Albernaz (29) was essentially with the Bulls all year, but only saw action in 23 games, 6 of those as a pitcher in the waning innings of a losing game. Catcher Mayo Acosta (24) came up from Montgomery to lend a hand for a couple of games (9) in May. He had a decent year overall. Very good chance that he will be in a Bulls uniform at some time next year. Infielder Sean Rodriguez (27) was sent down for two games at the end of the Bulls season in some roster maneuvering by the Rays. He won a game for the Bulls with a home run, then broke his hand in some sort of locker room incident. At the very end of the season two players were jumped all the way up from the Charlotte Stone Crabs played a couple of games, then went on to help Montgomery in their playoffs. Kevin Kiermaier* (22) played in four games and was the one and only young outfielder to play for the Durham Bulls in 2012. At a guess he’ll be playing in Montgomery next year. Robby Price* (24) is an infielder who played only in the last two games that were played in Charlotte. He went 3 for 6 in a promising start. 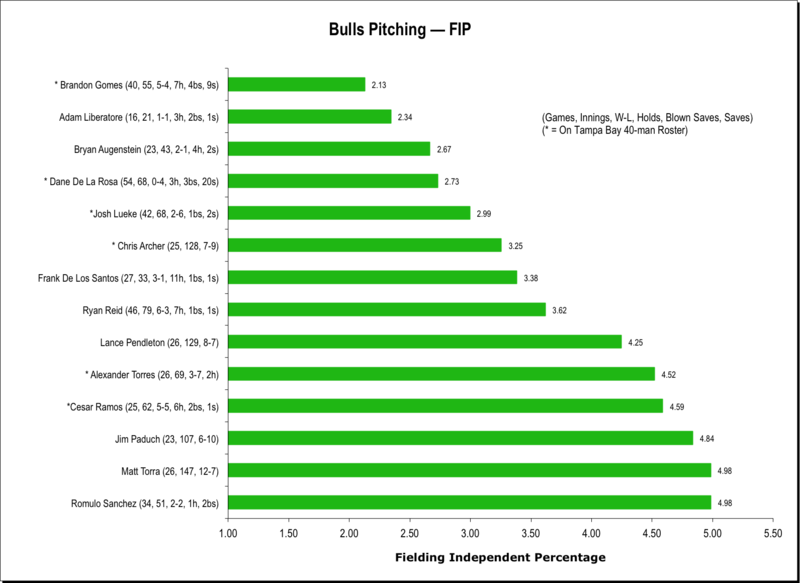 Here are the charts with the basic metrics for the pitchers we saw with the Bulls this year. Several that we saw are not on the charts because they just didn't seem to fit. 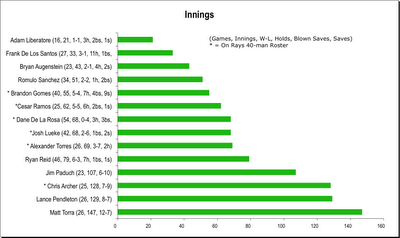 For example, Alex Cobb started 8 games, and did not do very well as a Bull (1-4) before going up to the Rays to stay. Alex Colome and Matt Buschmann came up from Montgomery for a couple of games near the end of the season (and looked very good). Jhonny Nunez appeared in 22 games before his release. On the other hand, Romulo Sanchez stuck with the Bulls for 34 games before his release. Also included is Bryan Augenstein even though he was on the DL for much of the year. 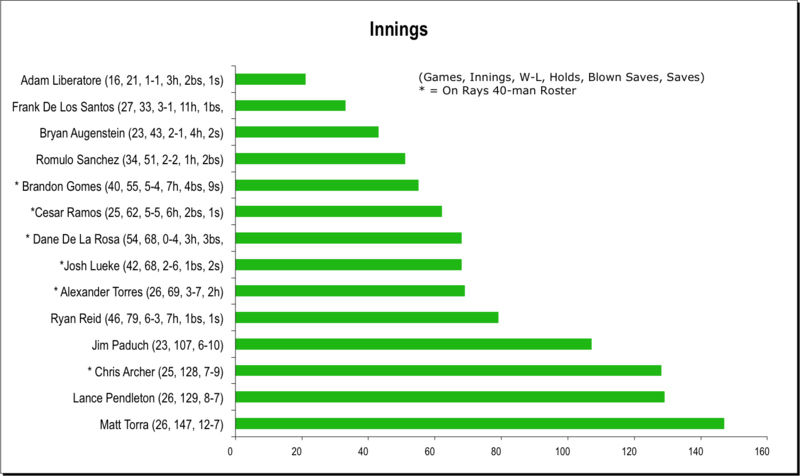 Note that most of the pitchers on the 40-man are now with the Rays: Dane De La Rosa, Brandon Gomes, Chris Archer, and Cesar Ramos. The two who are not had very different ends of the season. Josh Lueke's last six appearances were pretty awful (7 1/3 innings, 13 ER). 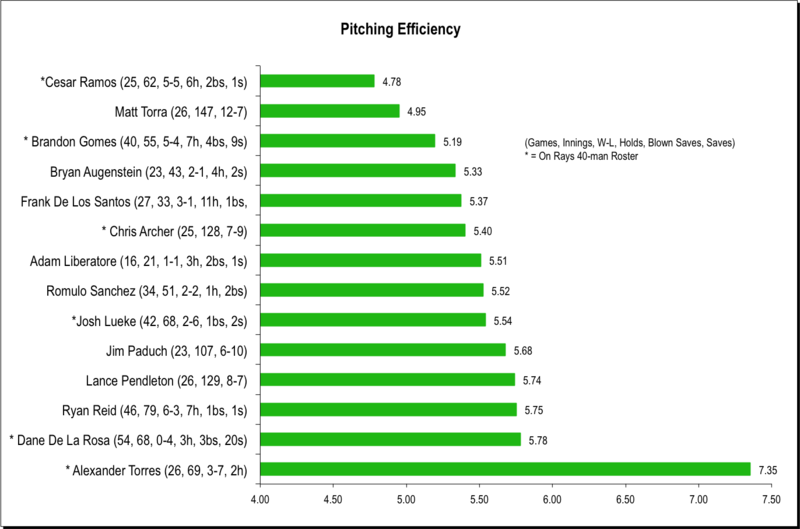 Alexander Torres, who comes off as the Bulls' very worst pitcher in just about every category this year, pitched a decent few innings in his last game on September 1st. Youngsters Adam Liberatore and Frank De Los Santos arrived near the end of the year, and looked pretty good. Looking at FIP, things sort out a bit differently. 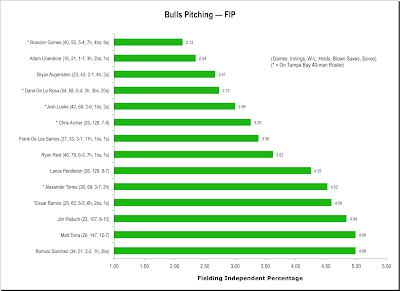 I wish I were more confident in FIP as a measure of minor leaguers. For the stats folks out there, I used a constant of +3.2 in the computation. Matt Torra, Lance Pendleton, Chris Archer, and Jim Paduch were the workhorses this year. 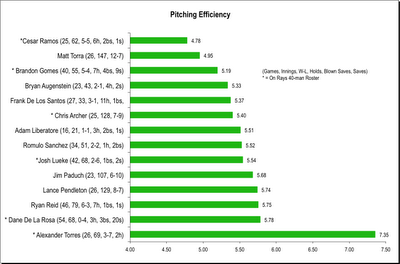 Pitching Efficiency is my name for a slightly quirky metric, pitches per out. Look at how hard Torres was working this year. Playing baseball before cozy crowds limited to intimate family and friends, the Pawtucket Red Sox (442 fans up in Rochester) and the Charlotte Knights (649 fans over in Fort Mill, SC) won their games and will be the contenders for the 2012 Governors' Cup. The first game will be played in Pawtucket on Tuesday. Wrap. Pawtucket made it look easy grabbing seven runs in the second inning and giving up only 2 hits and 1 run. Over at Knights Stadium a rain delay put off the end of the game for a couple of hours, and Indianapolis almost got back into the game. It is sad that the Carolinas, where Shoeless Joe Jackson, Moonlight Graham, and Crash Davis all played baseball before they were in Kevin Costner movies, could only find a couple hundred folks to watch a championship game. Pitiful, just pitiful. Meanwhile, over in Montgomery, 2,348 fans (that would be twice as many as the combined attendance at the IL games) watched the Biscuits get crushed 10-2. That's puts them a game away from elimination. Box, Montgomery Advertiser. Charlotte leads series 2-0. Series moves to Fort Mill tonight. Charlotte led 9-0 at 3rd innings and nearly let it get away from them. Pawtucket leads series 2-0. Series moves to Rochester, New York tonight. Mobile leads series 1-0. Players with time on the Durham Bulls squad, Sean O’Malley, Omar Luna, and Matt Buschmann, all had tough nights. Dane De La Rosa and Stephen Vogt have joined Brandon Gomes, Rich Thompson, Reid Brignac, Chris Gimenez, and Cesar Ramos as September call ups. Missing from that list is Chris Archer. Where is he? In Alabama! Yesterday afternoon he was on the bus with the Montgomery Biscuits heading for Mobile, Alabama. I guess the idea is to keep him in shape for a later in the week call up to the Rays. It isn’t entirely clear that minor league baseball will allow the move. Keep track of him by way of Stacy Long’s blog Biscuit Crumbs. Along with Archer, Kevin Kiermaier and Robby Price, who just spent a few days with the Bulls have also joined the Biscuits. 214 days to the next Bulls home game. UPDATE: Apparently Archer was not going to be allowed to pitch, so he's been promoted to the Rays. 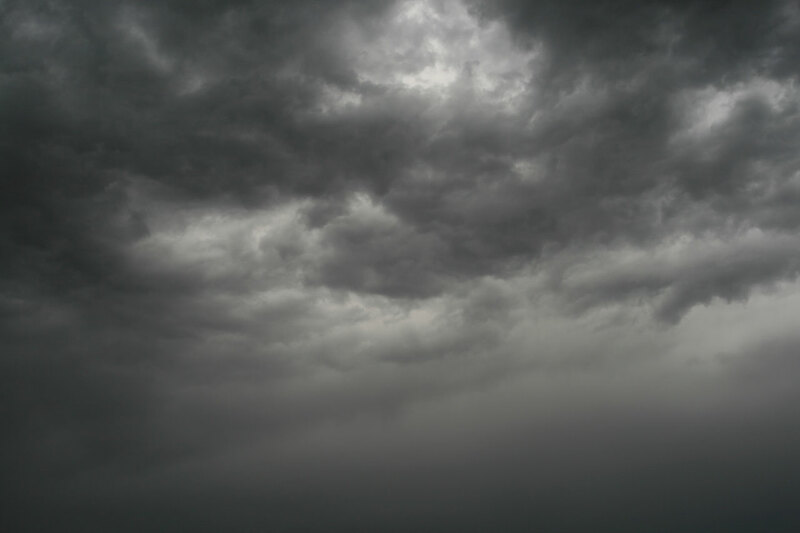 The clouds and rain rolled in. I’m guessing the umps had a fit of common sense and said to the managers, “Let’s call it a day.” And the managers agreed. After all, the Knights need to get up to Indianapolis for their playoff game on Wednesday. The Bulls? Well, the Bulls (most of them) just needed to go home. We’ll spend the next few days trying to wrap up this season. Regarding these last two games, the kindest review would point out that Chris Archer had a good start on Sunday; that Josh Lueke dug himself an even bigger hole in losing Sunday’s game; and that Leslie Anderson simply didn’t have enough time to get the hits he needed to win the batting crown. 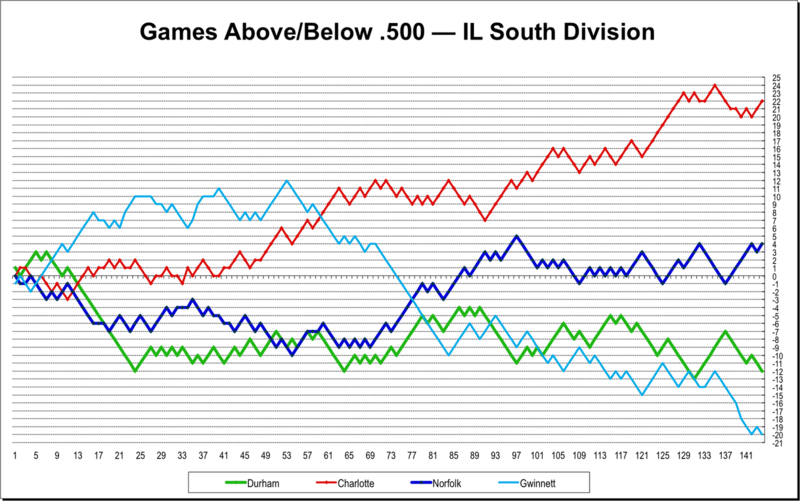 If we were looking for oddities (and we usually are) we’d note that in both games the Bulls outhit their opponents, but still lost. What could that mean? At a guess, the Knights were tuning up for the playoffs and the Bulls were not. 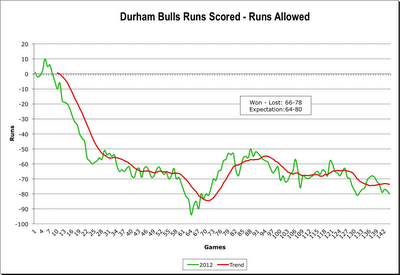 There was another oddity in this last game that creates a dilemma for Watching Durham Bulls Baseball. I need your opinion on an issue. The oddity was that Jim Peterson came into the game in relief and Robby Price started at second base. Back when we set up the Moonlight Graham Award, given to the Durham Bull with the least amount of time in a Bulls uniform, we set up a fairly simple set of criteria excluding a few categories of players who come through that we didn’t think should be eligible for the award. Not considered are players who come through on a rehab assignment, played only in postseason, and (for the pitcher) a position player thrown to the wolves at the end of a game. Should we add playing at the DBAP as a criterion for eligibility of the Moonlight Graham Award? The Tampa Bay Times is reporting that Stephen Vogt and Dane De La Rosa are being called up and speculates that Chris Archer could be called up soon. Bulls catcher Chris Gimenez hit two RBI yesterday to win the game for the Rays. Dane De La Rosa’s fourth pitch to the Knight’s catcher Josh Phegley was a strike, and Phegley knew it. He swung. He missed. 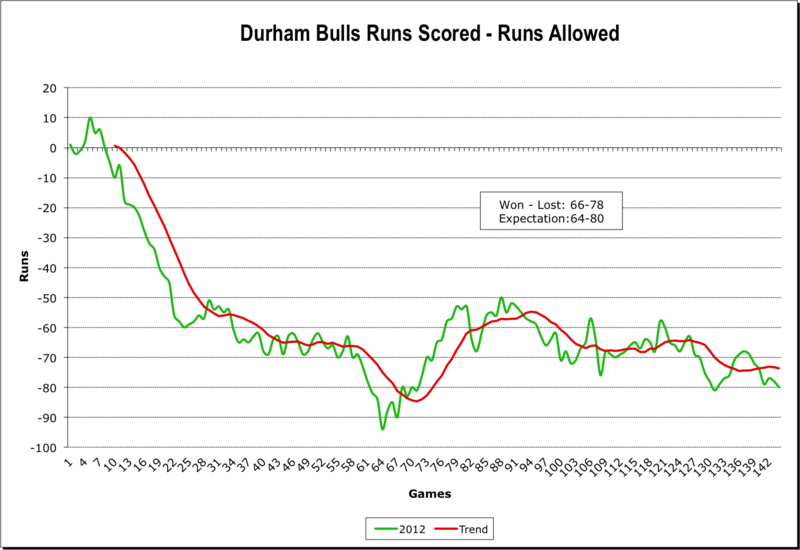 The 2012 season of the Bulls at the DBAP was over. 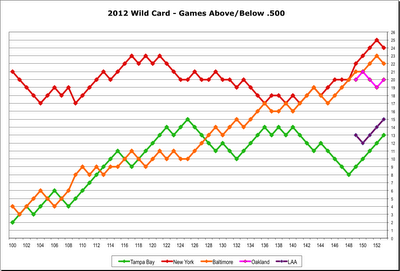 Yes, the Bulls have two more games to play and I’ll be doing some more charts and graphs and summing up. But, unless I decide to go to that AAA National Championship game, that was the last baseball action I’ll see at the DBAP this year. Very likely the last time on the DBAP grass for a lot of the Bulls and Knights as well. I am a die-hard Alexander Torres skeptic, but after a slightly shaky start last night, he was brilliant. It was easily his best game of the 26 he’s appeared in this year: 10 Ks, 1 walk (! ), only 3 hits. He simply had the Knights in his hand. As a fan I personally appreciate Charley Montoyo taking Torres out of the game after his 2 K’s at the top of 6th because it gave all of us a chance to show our appreciation as Torres walked off the field. Mr. Torres has had some awful experiences on the mound this year, but it certainly looks like his trip to Florida for the month of August fixed something (for details, see Adam Sobsey’s account at the Indy Week link). He’ll have some time to keep working on whatever he’s been working on. Will he be the pitcher so many think he can be next year? We’ll see. Ryan Reid got the win. That gives me a chance to thank him for his work this year. 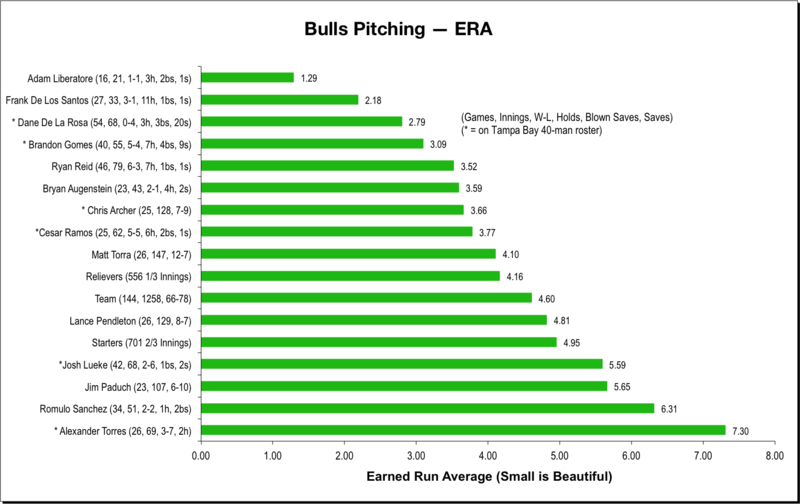 Something of an everyman for the Bulls: 46 appearances, 79 innings, decent ERA, a couple of spot starts, no trips to the DL. And I love that distinctive pitching motion of his. Frank De Los Santos had part of an inning, then Dane De La Rosa came in for his 20th save. Together, Bulls pitching accumulated 15 strikeouts, the best 9-inning performance of the year. Meanwhile, to give him his due, Charlotte’s Charles Shirek pitched a very solid eight innings, saving the Knight’s bullpen for the playoffs. He only made two mistakes: a walk to Cole Figueroa and a pitch to Brooks Conrad that was crushed over the right field wall, scoring the only runs of the game. All was well at the DBAP last night. 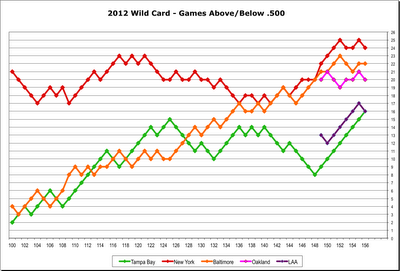 If the season had to end, and it did, it ended with interesting baseball. What more could we ask for? Brandon Gomes got called up to the Rays. At .308, Leslie Anderson is 6 points back of the leader in the batting title competition. The Montgomery Biscuits clinched a playoff berth in the Southern League. Coming up from the Charlotte Stone Crabs, infielder (mostly 2B and 3B) Robby Price. He's in his third year with the Rays system and doing OK. Stats. 24 years old, throws right, bats left (of course). In from Hudson Valley, drafted this year out of Northwestern University, catcher Goeff Rowan. 15 professional at bats in 8 games. Opponents are unlikely to have any charts on him. Stats. 22 years old. R/R. Two more candidates for the 2012 Moonlight Graham Award. No telling when they'll be in the dugout. 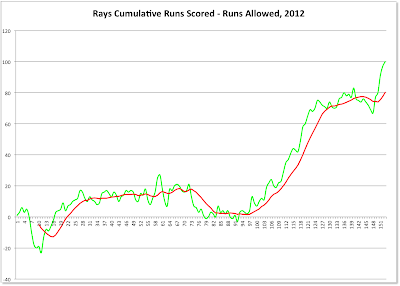 We can hope they were started moving when the Rays began making their decisions. Bulls infielder Will Rhymes was designated for assignment today to allow Jeff Niemann to come off the Rays’ disabled list. That means that Rhymes will have to clear waivers to play for the Bulls. I don't see how that can happen before the end of the Bulls season. That also means that the Bulls go into tonight’s game with exactly 9 position players. I wonder if any of those guys in the bullpen would like to DH if something goes awry? How about tonight’s starter, Alex Torres as a DH instead of pitching? Probably wouldn't be any worse. Cant' pitch, maybe he can hit. Gotta admit that's an interesting twist to the game. Usually it's a position player who goes out the mound as a sacrificial lamb. Maybe tonight we'll see roles reversed, with a pitcher having to borrow a bat and getting a quick class from hitting coach Dave Myers on which end to hold. It was a steamy night and about all we had on offer was a couple of quirky moments. Otherwise, the Bulls seemed to be more than a bit flat. After last week’s 6-game win run, the Bulls have dropped four in a row. They won’t end the year in the absolute cellar, but they’re working on it. One of the mantras of baseball, especially “small ball”, is to never let the leadoff runner on base. Particularly unpardonable is to walk the leadoff batter. But Charlotte did let the leadoff runner on eight out of nine times last night, and half of those on walks. Nevertheless, only one of those runners scored (new guy Kevin Kiermaier, we’ll get to him later). Three double-plays killed any chance of those leadoff runners making a difference. Leslie Anderson had an 0-fer night, dropping his batting average to .308. The three players ahead of him on the list have been called up, meaning that their numbers can’t change. So all Leslie has to do is raise his average up to .315 over the next three games and he’s in! Jim Paduch’s final start of the year began really ugly with a home run. Then an error, wild pitches, passed balls and a couple of singles set up a 4-run inning. That was enough. A few innings later, he was followed by Josh Lueke, whose end-of-season work has not been impressive. He’s let in 13 runs over his last six appearances. I’d guess his hopes at a call-up are fading fast. On the other hand, Brandon Gomes and Dane De La Rosa are looking good. 3 innings with no runs and 6 Ks between them. The Bulls started the night with exactly one position player on the bench (if you don’t count the designated hitter), new guy Kevin Kiermaier. He came in for Jesus Feliciano in the 7th and singled up the middle, got to third base when the next two batters walked, and came home on a passed ball. The next inning he ran into the center field wall. (I wonder. 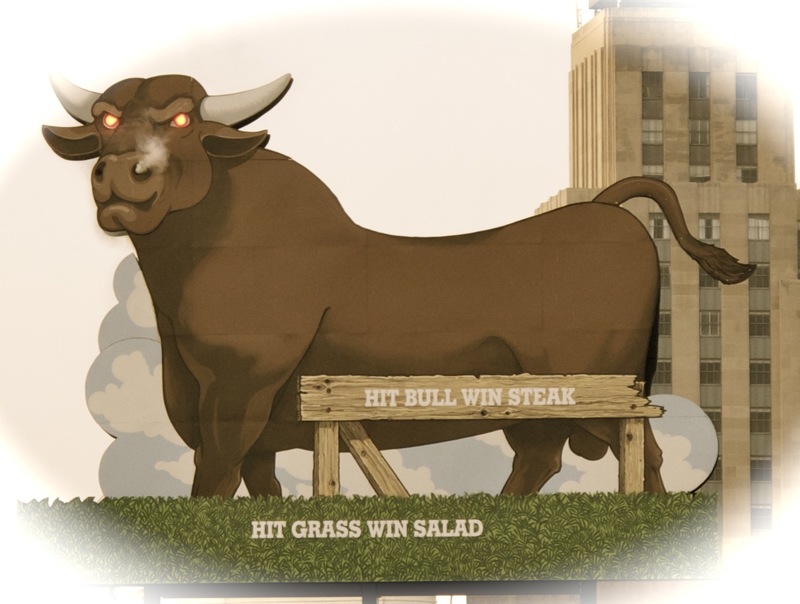 The Bulls didn’t take batting practice yesterday. Was that his first time ever in the DBAP center field?) He drew a walk for his AB in the 9th and got to second base, but Henry Wrigley flied out with the bases loaded. He’s probably a lock for our Moonlight Graham award (unless someone else gets called up to fill the hole, but maybe we’ll get to see some more of him next year. Last home game tonight! No more Durham Bulls Baseball at the DBAP in 2012. Expecting another sell-out crowd. 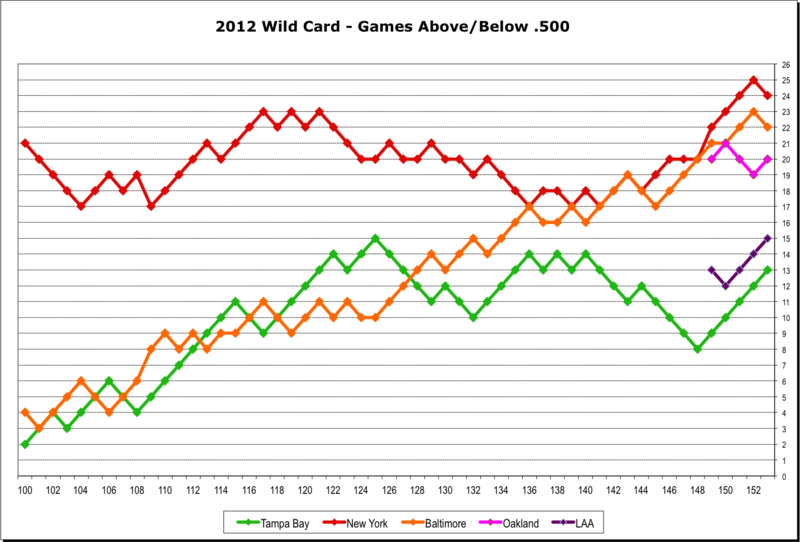 Let’s hope for some good baseball to end the year. Adam Sobsey at Indy Week is reporting that Dan Johnson was called up to the White Sox last night. Good for Dan. Seems like end-of-season call-ups are his role in baseball.